Set of western style antique brown color spurs and strap package. Hand engraved silver overlay and praying cowboy motif on trim. 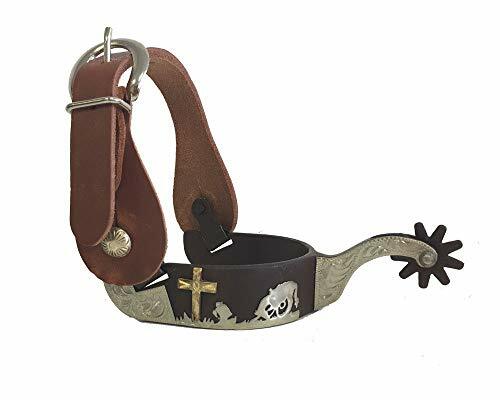 Billy Cook Saddlery brand harness leather spur strap adult size. Men's size. 3 1⁄4" opening, 3 1⁄2" deep. Band: 1 7⁄8" brown steel with silver overlay Shank: 2" raised shank Rowels: 1 1⁄4" 10 pt brown steel Strap size: Adult 10 1⁄2"
Kelly Silver Star jingle bob spurs are an affordable jingle bob spur; with a 1/2 inch chrome plated band with 16 point rowel and black jingle bobs. 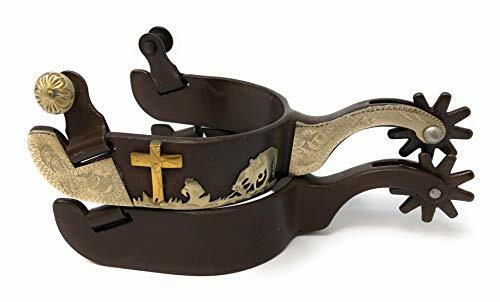 If you picture yourself as a cowboy or sheriff in the old west, these spurs will be the perfect addition to their costume. 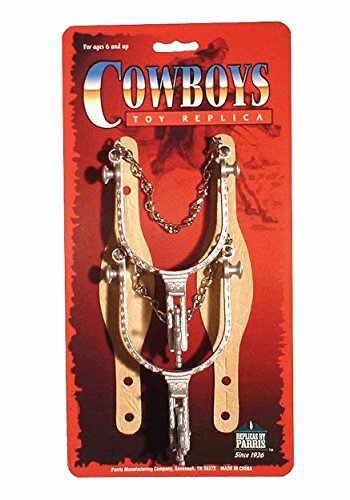 Cowboy Spurs feature straps to attach them to your cowboy boots. 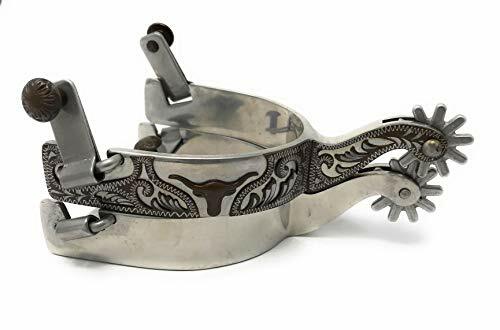 Dress up like a real cowboy with your own spurs. Great for Halloween or just for looking like a cowboy at the grocery store! Includes 2 65"-long plastic spurs, die cast star, and metal chain with an adjustable vinyl strap. 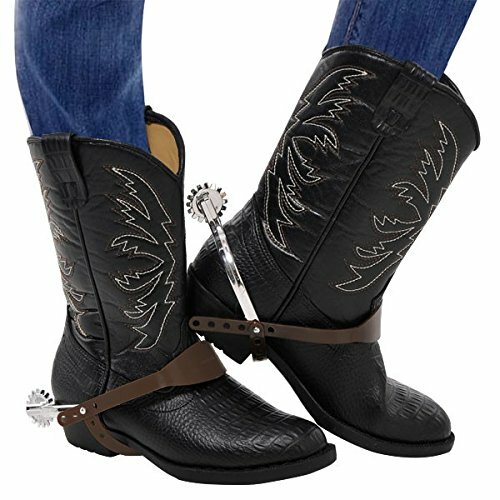 These are great western cowboy boot spurs. Very similar to the boot spurs Clint Eastwood wore in: "A FISTFUL OF DOLLARS", "A FEW DOLLARS MORE", and "THE GOOD, THE BAD, and THE UGLY". 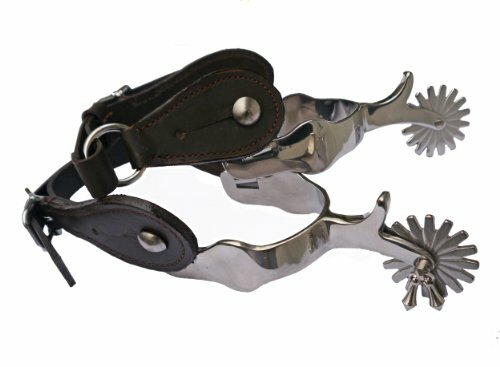 These high-end stainless steel spurs come as a pair with the dark brown genuine leather straps attached. They jingle when you walk ... "JUST LIKE IN THE MOVIES !!!"